The Morning which Breaks (all roughly 640 pages of it) has been submitted and is in review at Amazon. We will update here as soon as it goes live! Here it is: a Date! We finally have a date. Since we can’t predict Amazon’s approval cycle (though we hope and expect it will be quick), it is the date we will submit MWB for publication, not the date it will actually go live on Amazon. That date is: no later than Memorial Day weekend. The pacing factors right now are getting the final cover and finalizing the glossary. Thanks to everyone who’s stuck with us through this long haul! I don’t know if anyone beside myself recalls “Around the World in 80 Days”, the Jules Verne novel made into a rather charming movie with David Niven as the protagonist: a British eccentric named Fogg with a decided fondness (nowadays we would say an obsession) for clocks, who nevertheless manages to get the girl in the end. You can tell from that fact alone, without knowing anything else, that this novel was written in the 1870s. I find it somewhat ironic that in the 140 years since that story was published, we have out-Fogged Fogg to a degree unimaginable up until very recently. Fogg was famous for having a clock in every room. We—especially we here in the US—generally have up to a half a dozen, maybe more. We are surrounded by clocks to an astounding degree (anything with a chip in it has at least one), and the clock-makers (like our society in general) are obsessed with dividing time in ever smaller slices. And all these clocks are busily ticking away, counting off the increments of that most problematic entity and making some of us feel guilty or apprehensive or frustrated (or all three) by doing so. We have been, to no small degree, among of the afflicted. You see, quite some time ago, we set ourselves a deadline. And then we let it pass. And let it pass again. In fact, between last September and Christmas, we let it pass four times, at which point we decided that deadline needed to be retired, so we did. It’s our deadline; we can put it out to pasture if we want to. But we cannot stop the clocks from ticking, nor can we ignore the fact that the task to which we set ourselves goes undone. And that is why I am thinking on clocks. But I am also thinking on clocks because, now finally, the end—well, at least the beginning of the end—it is in sight, or better yet, in focus. We can see details formerly obscured and conquer them. And we are doing so. Now, as the clocks tick, the To-Do list shrinks in proportion and we get closer and closer to unleashing the fruit of all this labor on an unsuspecting world. No doubt the world will remain unsuspecting as it will take no notice whatsoever, but a teeny-tiny fraction might, and it is possible that you are in it. At least we hope you will be in it. So watch this space for an announcement in the not-too-distant future. That is all that I will say for know, except that I knew this mountain once, and now I know how she felt. As we mentioned previously, we have a new glossary available. It is greatly expanded from the current version, adding some organizational details and bits of key history along with technical descriptions and definitions of terms, and a list of personalities that have appeared in the series so far. Right now there are almost 250 entries (247, though we may add a couple more on review), and 86 people listed. As the glossary will be included in MWB, we won’t be posting it here of the site, and we’ll remove the obsolete copy currently posted when the MWB is published. If you would like an advance copy of the new glossary to go along with the chapters we’ve been releasing, leave a comment. The most reliable format right now is an HTML file; we currently lack the ability to make a PDF with internal links (of which there are many). Hey! Where’s My New Chapter? Some of you may have been wondering if we are going to post anymore sample chapters of MWB here. Our plan always was to keep posting sample chapters until we got to the end of Part 1, if we hadn’t finished the draft at that point and sent it out to our beta readers. Having reached that point, and with the draft as yet unfinished (although we are working feverishly on it), we faced a bit of a dilemma. We enjoy the valuable feedback we’ve been getting and want to keep people engaged, but given the length of Part 1 (within is, by itself, a shade over 15% longer than Alecto), we’ve decided not to post any additional chapters publicly. We do appreciate that we have some awesome readers to whom this will not be welcome news, so we are going to do the following. If you want to continue reading sample chapters until we get the draft completed, leave us a comment here. We will contact you directly via the email you provide and make arrangements to send you additional chapters as they become available and (hopefully) we’ll have the draft done soon. Thanks to everyone for your continued support of our endeavors! We are giving away copies of The Alecto Initiative at Goodreads! 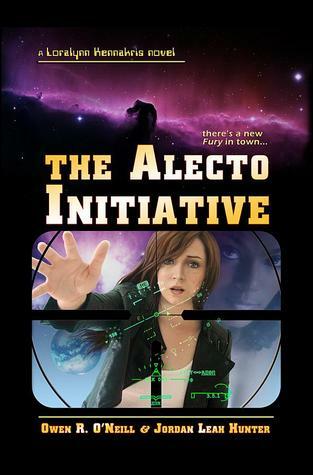 We are giving away seven copies of the paperback edition of the The Alecto Initiative at Goodreads! Enter before June 25th to be eligible to receive one of these free copies. Please read the previews here before entering this giveaway. This book contains themes such as human trafficking and abuse that will disturb some people. Please do not enter this giveaway is you are not comfortable with such subject matter. We are making the Kindle edition of The Alecto Initiative free tommorrow (Jun 2) on Amazon! We will also be posting a new chapter from The Morning which Breaks here tomorrow. Enjoy! The Alecto Initiative Paperback Edition Now On Sale! The print edition of The Alecto Initiative is now on sale at the CreateSpace store! Only $7.99! If you would rather read without electrons involved–and we certainly sympathize with that!–get this paperback edition and stretch out in the sunshine! Would you like to read another excerpt and feed us some feedback? Go here to read another free chapter of The Alecto Initiative and tell us what you think!